This entry was posted in Feature and tagged cassavabase, flowering, gender, genomic selection, media, photo gallery on 2018-03-23 by smhautea. Practical skill acquisition in genomic prediction modeling forms the basis of my brief visit to Cornell. 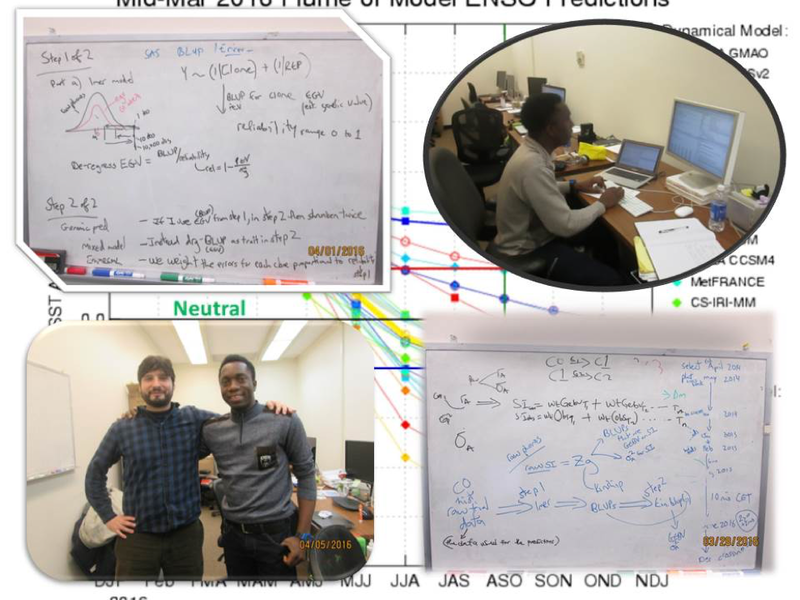 I got handy explanation on prediction modeling processes as they apply to past and present genomic selection cycles as being implemented in IITA-NextGen Cassava Breeding Project. Marnin Wolfe, postdoctoral associate at Cornell, was able to guide me from the known in Genomic predictions in general to the unknown with practical step-by-step activities using the IITA-NextGen cassava dataset. I received concrete training on the use of single step model and information on the limitation to it, as it could be computationally intensive with large datasets. Also, I was trained on two-step model, formation of the kinship matrix using the “A.mat” function, model.matrix, kin.blup phenotype dataset curation for prediction modeling, G-BLUP model, RR-BLUP model, the inclusion of multiple random effects in prediction modeling using the EMMREML model and general theories and coding syntaxes associated with these above-mentioned models. One of the newest concepts to me in all was when I was guided through the IITA-Cycle 3 prediction, de-regressed BLUPs, especially with the theory and concept of reliability estimation, PEV, and how these influence the accuracy of our predictions. Marnin did well in guiding me through these concepts both theoretically and practically, coupled with exercises, reading assignments, brainstorming sessions. To wrap it up, I was guided through the entire IITA-GS Cycle 3 prediction model; the code was provided to me by Marnin with detailed explanations. Hence, the rA could be appropriately fitted in the breeder’s equation for the expected gain estimation. Dunia (Research Associate) guided me through GWA-studies with the use of datasets on plant type and the associated SNP data. For better handling of the categorical nature of the Plant Type trait (compact_1, open_2, umbrella_3 and cylinderica_4), Marnin suggested the classification of the trait as binomial scores (E.g. Compact: 0_absent, 1_present), hence coding the scores as a trait per time. It was to enable us to fit a GLIMMIX model with the flexibility of a link function for variance components. I participated in the research group and graduate student seminars and symposiums. I can practically implement Genomic prediction with more confidence on availability of appropriate dataset. I got a detailed understanding of the past IITA GS Cycle selection and a first-hand understanding of the present Cycle 3 predictions (Thanks to Marnin). I got a better clue on several aspects in statistical modeling to be included in my thesis report, especially the expected gain estimation concept and some genomic prediction steps. My appreciation goes to Dr. Jean-Luc Jannink for the time and audience given to me while I was in Ithaca; the meeting for updates in his office and facilitation of my visit; amidst other. Many thanks to Marnin for devoting much time in coaching me. In fact, he was my tutor all through the period I was in Ithaca. Dunia did a great job as well as my NextGen graduate student colleagues, Ugo, Uche, and Alfred. Alex of BTI is appreciated for his kind gestures all through my time in Ithaca. I would not but mention the logistics from Dan’s end, Karen and the team in IP-CALS office. I want to thank my supervisors in IITA, Drs. Peter Kulakow and Ismail Rabbi, for granting the home-support needed to visit Cornell this period. Thanks to Dr. Chiedozie Egesi and Dr. Hale Tufan. My final appreciation goes to the Cornell-NextGen Cassava project for the full support. My regards to all. This entry was posted in Genomic Selection and tagged cassava, Cornell, genomic selection, IITA, Jean-Luc Jannink, Nigeria, Olumide Alabi, students on 2016-05-13 by dpt44. During the recent annual AAAS (American Association for the Advancement of Science) meeting in Washington, D.C., The Economist interviewed Dr. Chiedozie Egesi, NextGen Cassava project manager. Chiedozie spoke about the potential of the NextGen Cassava project to improve the cassava crop and address challenges such as disease, low yield, and vitamin deficiency. See the full story, “Cassava-nova,” in the online edition of The Economist. This entry was posted in Genomic Selection, Press, Uncategorized and tagged cassava, Chiedozie Egesi, Cornell, genomic selection, IITA, NaCRRI, Nigeria, NRCRI, press, Uganda on 2016-02-23 by dpt44. 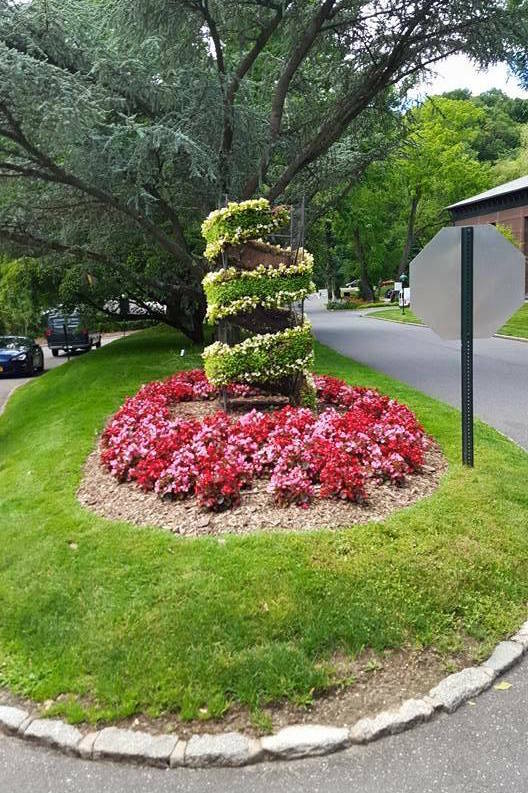 CSHL is considered among the leading research institutions in the world in molecular biology and genetics. Not only because of its history (considerable long list of noble laureates) but also for the current research taking place there. Part of my research as a graduate student is focused on using high-throughput genomic data to identify functional regions across the cassava genome and try to use this information to improve Cassava GS-assisted breeding. Some of the high-throughput genomic data will come from transcriptome sequencing, chromatin footprinting and methylation profiling analysis. High-throughput sequencing has become a major technique in biological research. However analyzing big data sets, products of these technologies, carries some challenges that are not always properly tackled. These kinds of errors can threaten the biological inferences that are made. All the techniques that I planned on using for my research carry some unique difficulties and sometimes complex statistical principles underlying their analysis methods. This course tackled all those techniques, and the instructors and speakers have wide experience working with that kind of data. That’s what initially caught my attention to apply for this course. After taking it I have to admit that it was as good as it could get. All the instructors were great; each of them leads their own top-notch research group, and they were really helpful and resourceful. The invited speakers were great as well, showing some of the latest techniques and applications of next-gen sequencing. The attendees came from a wide variety of fields and from all around the world, working in both Academia and private companies, and the wide variety of their study fields (cancer, neurobiology, plant genomics, immunology and more) really assured lots of interesting discussions. 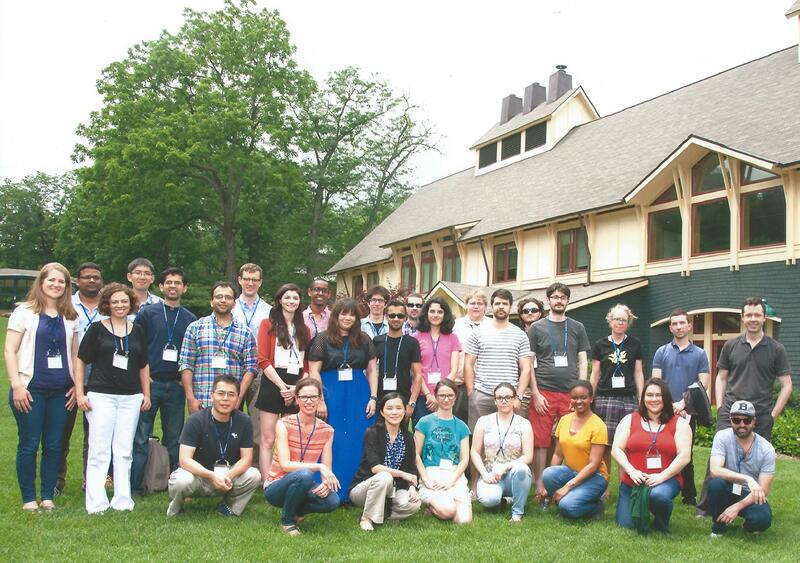 Finally I had to mention that even the location of the Cold Spring Harbor Labs was something else, a beautiful environment that let people focus on their research. This entry was posted in Genomic Selection, News and tagged Cold Spring Harbor Laboratory, genomic selection, Roberto Lozano, students on 2015-09-01 by dpt44.